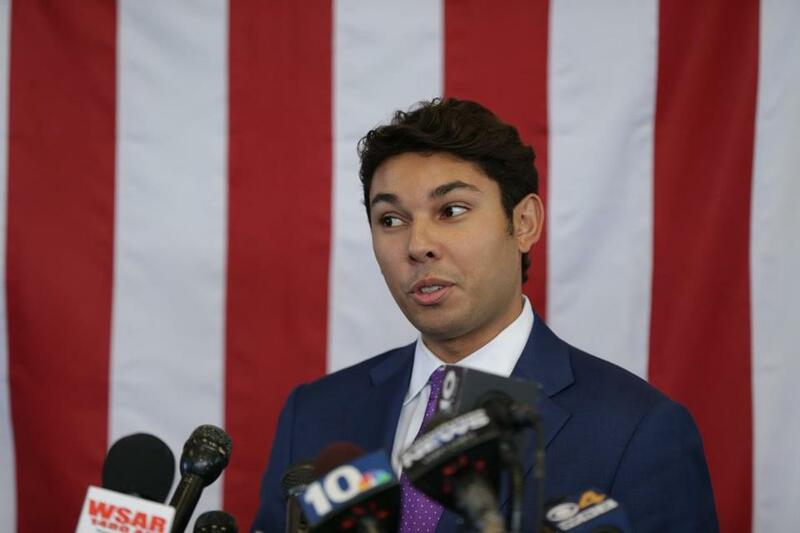 Fall River Mayor Jasiel Correia said at a press conference in October that he would not step down from his position. Fall River Mayor Jasiel F. Correia II has a city to run and a federal criminal indictment to fight. Since his arrest in mid-October on charges of defrauding investors who backed his tech startup, SnoOwl, the 26-year-old has refused to relinquish power or discuss the criminal allegations in detail. On Tuesday, he even declined to say whether he will attend a hearing in federal court in Boston this week. One of Correia’s lawyers, Kevin Reddington, said Correia isn’t required to attend the session Thursday morning and said the mayor won’t be there. The hearing before Magistrate Judge Mary Page Kelley is intended to plot out routine legal and scheduling matters, he said. Another lawyer for Correia, Mark A. Berthiaume, notified the court Tuesday that he was withdrawing from the case, records show. He didn’t immediately respond to a request for comment. Fall River’s Board of Election Commissioners is in the process of reviewing 5,845 signatures submitted in mid-November by a group seeking to recall Correia. The organization needs 2,510 signatures certified for the recall to proceed. Joseph Pereira, spokesman for Fall River Recall, which is organizing the recall campaign, said he doesn’t expect city election officials to complete their review for a few weeks. Kelly A. Souza-Young, who leads the city’s board of election commissioners, said Tuesday she can’t disclose signature numbers until the certification process is complete. If enough signatures are certified, Correia would have five days to resign before the City Council could schedule a recall election. The city charter says such an election would be held at least 65 days from when the signatures were certified. Correia, a Democrat elected in 2015, has said publicly that he would run in a recall election if it comes to fruition. The FBI arrested him Oct. 11 on charges that he took more than $231,000 that investors gave him for SnoOwl and spent it on expensive travel, casinos, adult entertainment, and a luxury car. Prosecutors allege he then filed false tax returns to conceal the scheme. Correia has pleaded not guilty. He is in the first year of his second two-year term. In November, the City Council overwhelmingly approved a no-confidence vote in Correia and requested his resignation. A third measure that would have removed him from office while his federal criminal case was pending failed by a vote of 5-4. He documents his public duties on his Facebook page, where Correia has posted photographs of himself at ribbon cuttings and a holiday parade and shared videos of live interviews he has given to the Fall River Reporter, an online news site.